Eight residences and St. James’ Episcopal Church were the recipients of the 2017 Golden Arrow Award. 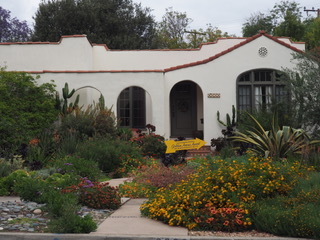 The homeowner took advantage of a rebate opportunity offered for drought tolerant yards and created a whimsical mixture of Southwestern and Mediterranean design. Statement agaves and cactus are the back drop for an orange/red/ yellow palate of alternating flowering plants with cooling spots of blue/purple. White roses and variegated Westringia ‘Morning Light’ beautifully compliment the stone work of the 1907 church. A flower bed of Salvia, miniature Morning Glory, Marigolds and Petunias add a splash of color. The English formal garden in a Californian climate is filled with shrubs that attract hummingbirds and butterflies. The walkway is lined with established decorative loquat trees and Goodwin lavenders release a beautiful fragrance to passing foot traffic. 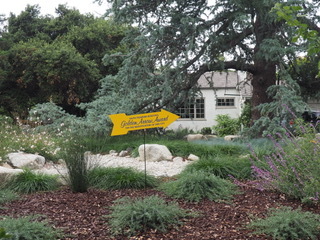 The front yard was terraced and reconfigured with boulders to compliment the home’s arroyo rockwork and walls surrounding an old Engelmann Oak. This home features a low maintenance, low water use garden with a contemporary Japanese craftsman influence that also could be dog and child friendly. 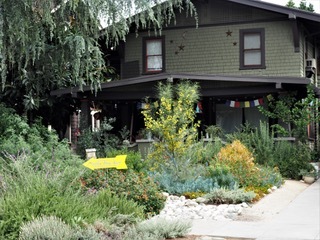 This 1908 Craftman home features waterwise plants and California natives to attract butterflies, bees, and birds. 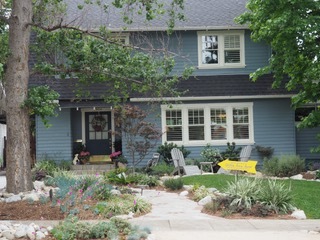 One side of the walkway mirrors the other with sages, lavender and yellow spurge Euphorbia. The use of a colorful, drought tolerant palette of red, yellow and purple includes a Palo Verde tree, lantana, cactus, succulents and the whimsical yard art makes this garden a friendly and inviting retreat. The mature cedar is beautifully featured and supported by a consciously subdued color palette, creating a harmonious and serene setting. The sound of a fountain in the quiet shady seating area in front of their house its the top note to transform the sound of a busy street into white noise. Adjacent to the house, tucked into the shade of the mature trees, is a seating area welcoming and engaging the passerby to say hello. The home is painted cleanly in neutral colors that harmonize with the Sencios, Calandrinia, Cistus and Dianella.